Type specimen: C. B. Clarke 28440A resides at KEW (specimen K000750218) and (CAL, E, BM, B?). Epithet: Named for the collector Charles Baron Clarke. A small, creeping species with a distinctive efarinose, orbicular leaf blade to 1.5cm, a crenate margin and a distinct broad petiole. The flower stem is obsolete or very short and flowers are borne singly. Flower color is rose-pink and the corolla is exannulate. Known from only the type locality. 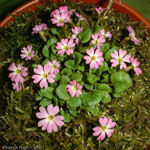 Hybridizes with P. rosea and P. warshenewskiana represented in the last two images.